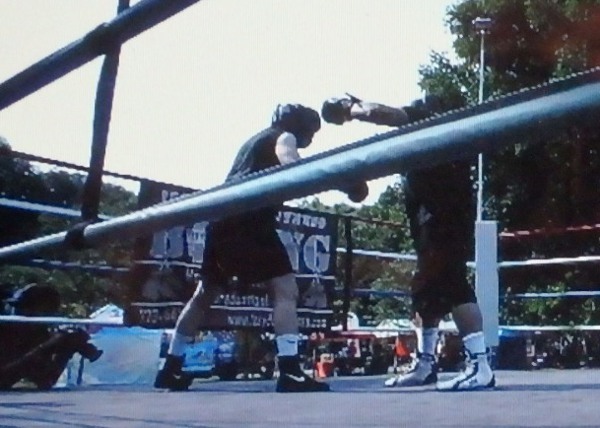 at Riis Park Aug. 10-12. 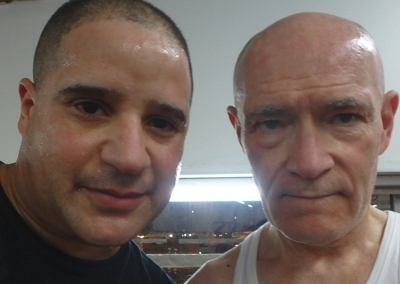 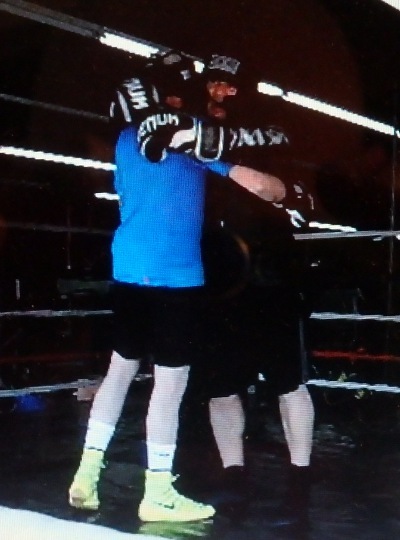 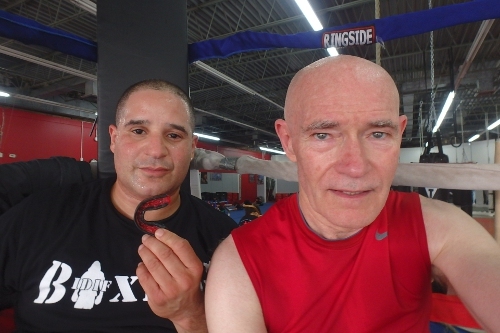 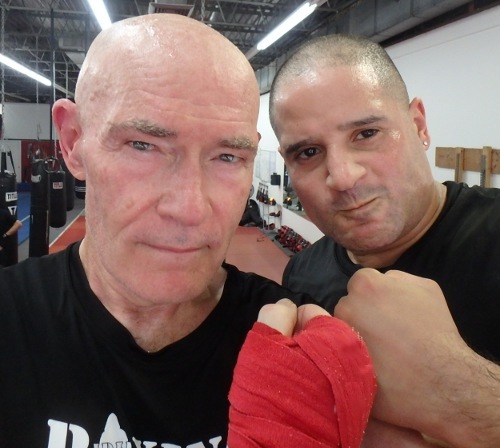 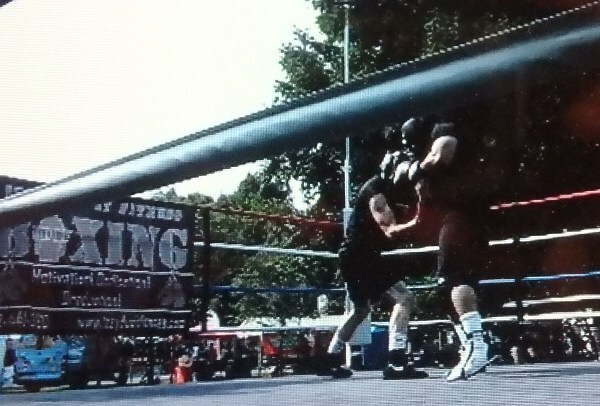 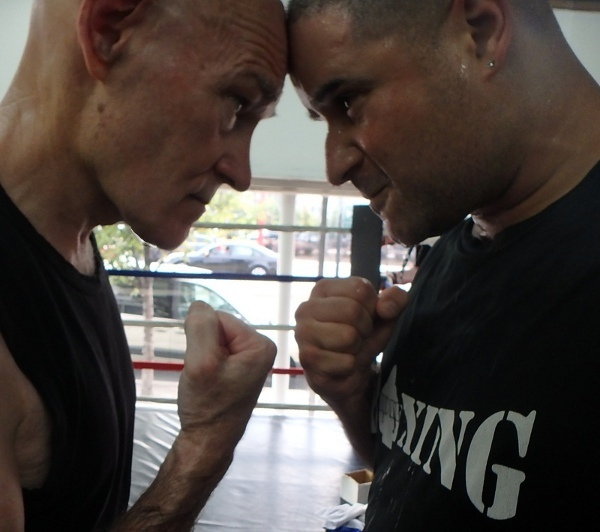 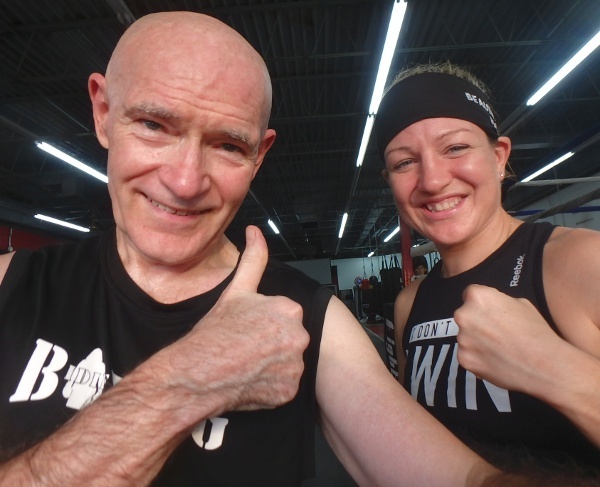 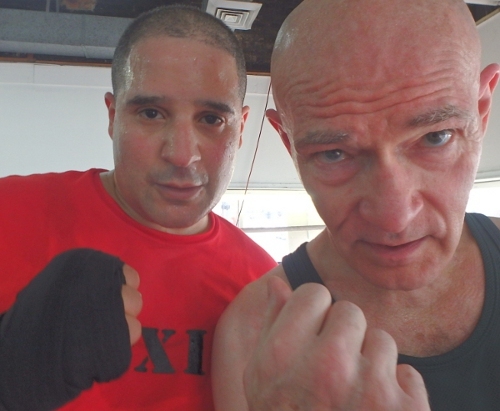 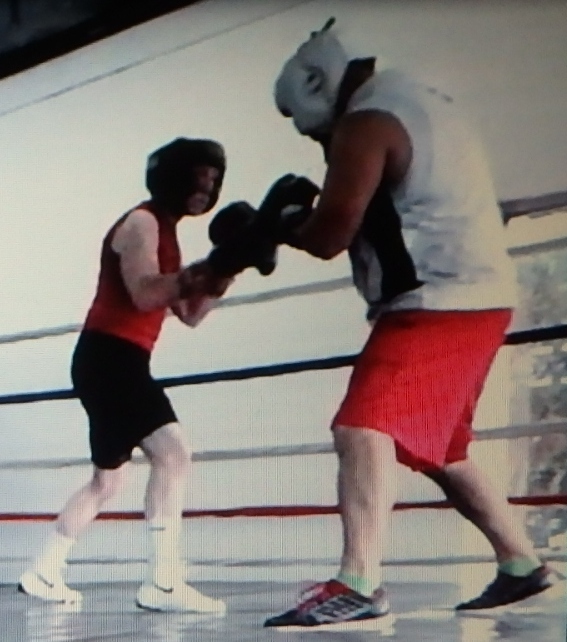 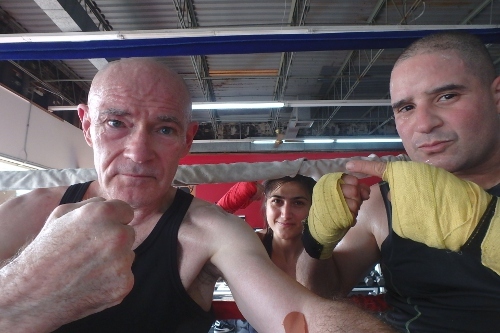 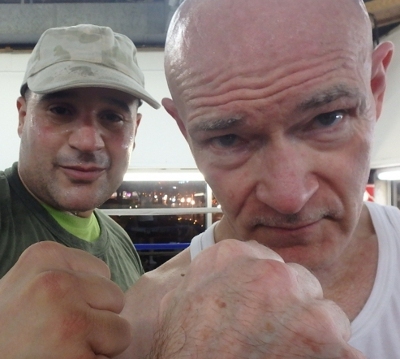 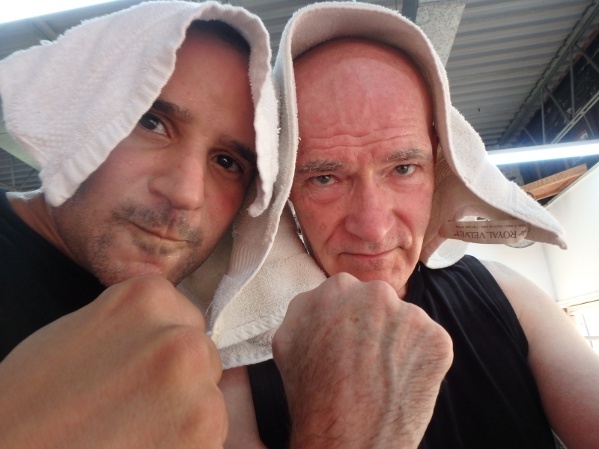 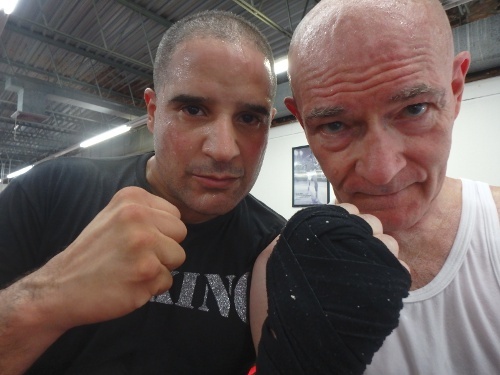 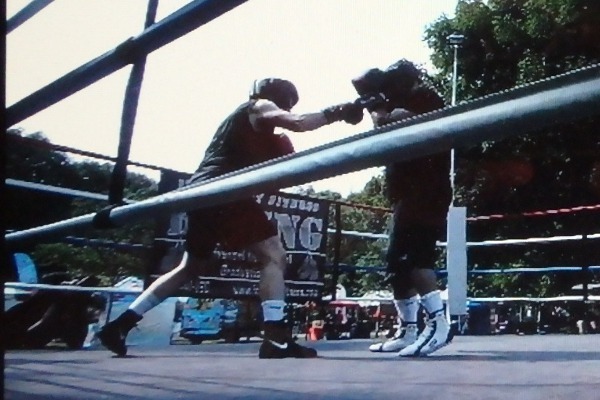 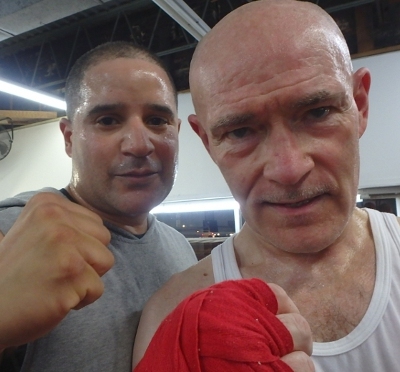 On Saturday, Aug. 11, Coach and I sparred 3 rounds. 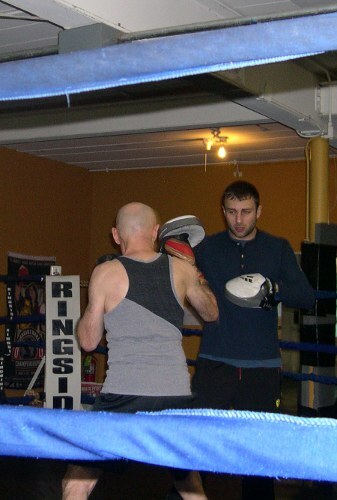 Coach figures he won & who am I to disagree? 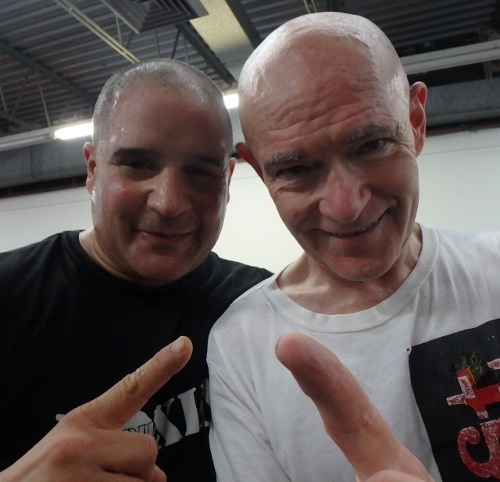 It is always an honor to get in the ring with this great fighter, but this time we did it with fighters and coaches and a few more bystanders than we have at EKF. 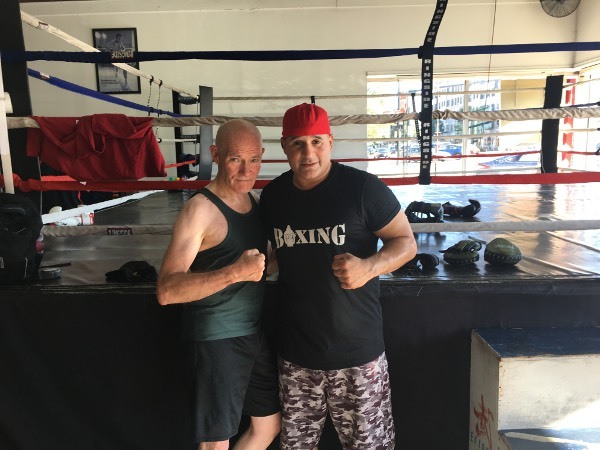 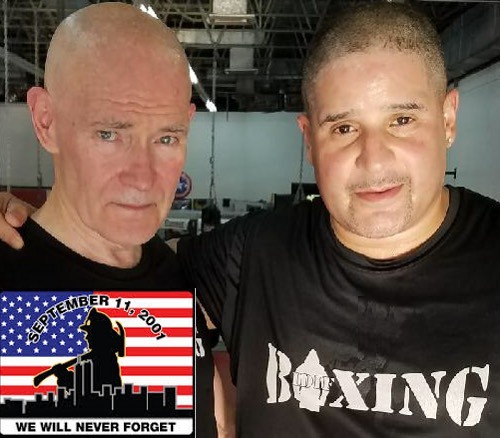 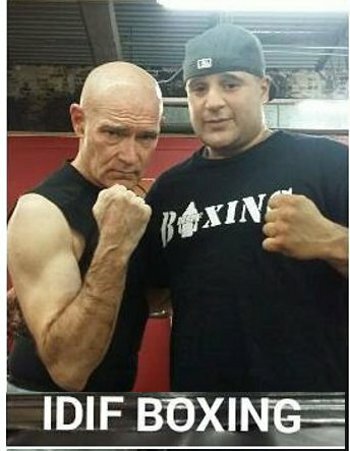 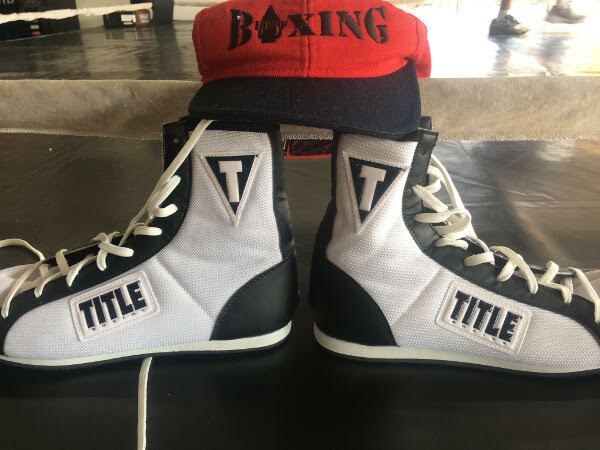 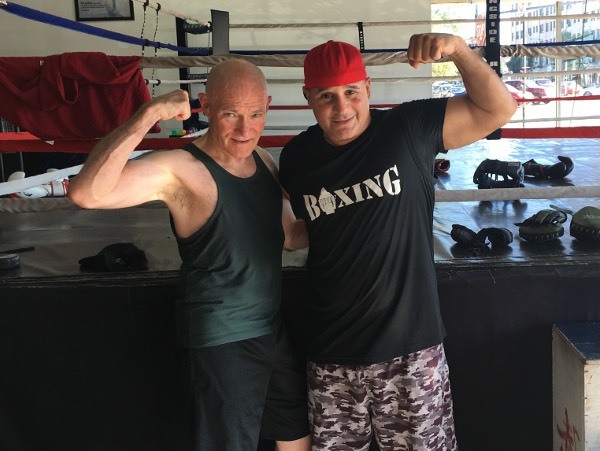 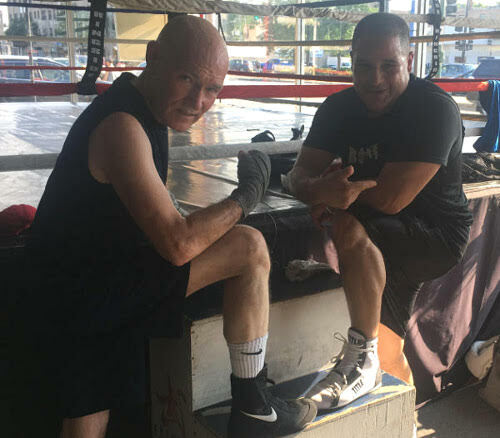 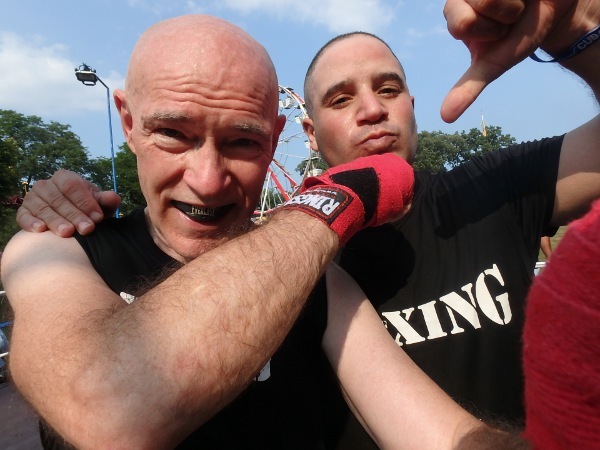 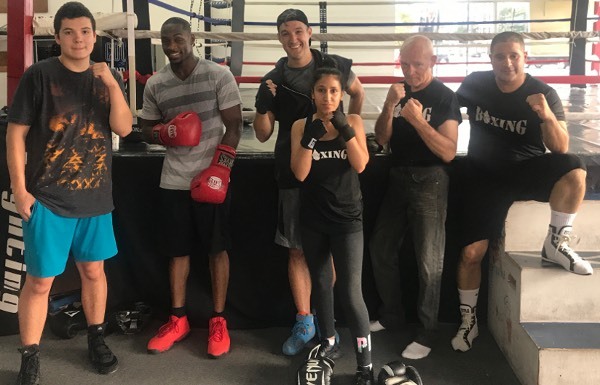 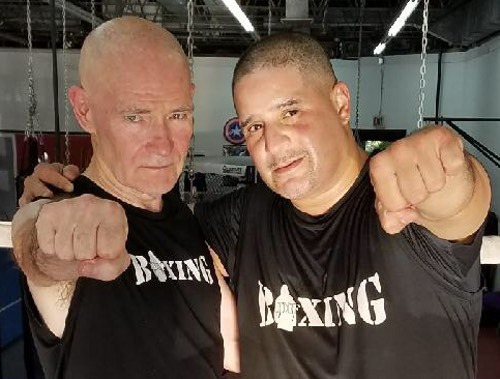 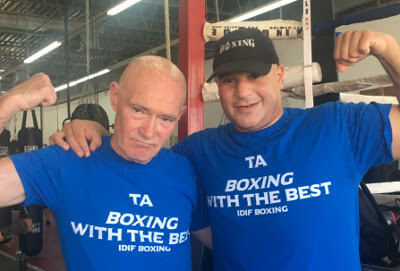 IzzyDuzIt Boxing was featured in June 2018 on the 4BoxingNews.com website. 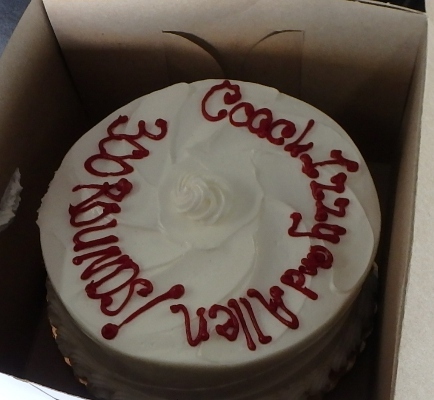 Congratulations, Coach! 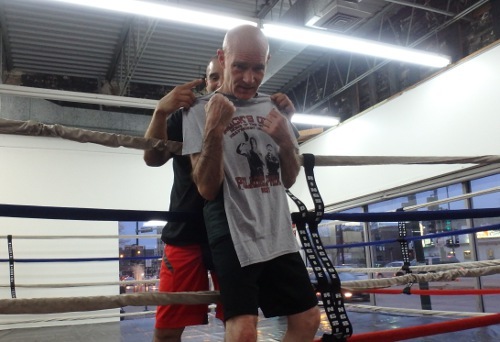 Great to see you and your boxers getting this attention. 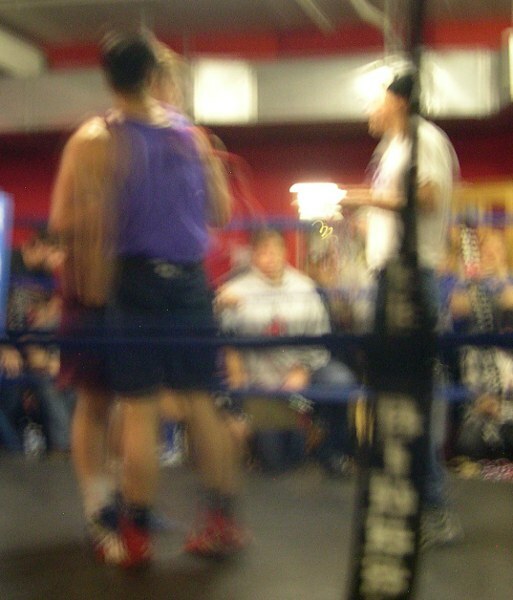 Round # 1000 Saturday, April 7. 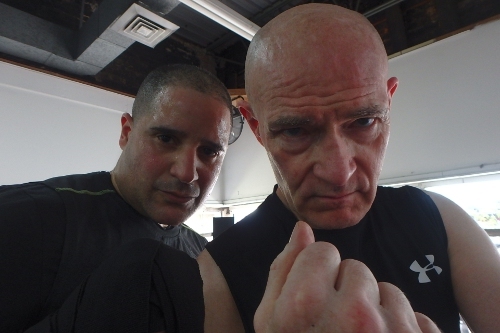 We pushed the number to 1005. 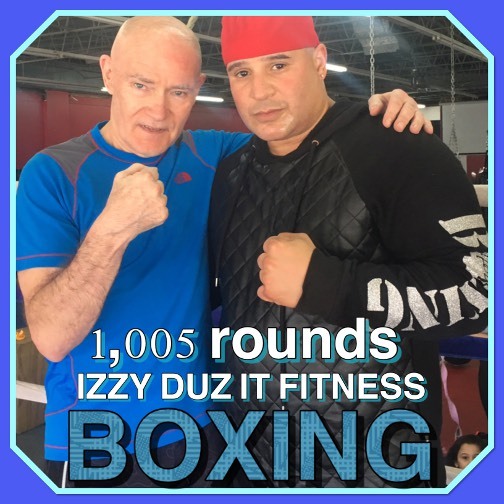 Coach Izzy and I crossed the 700-round mark July 5, 2017. 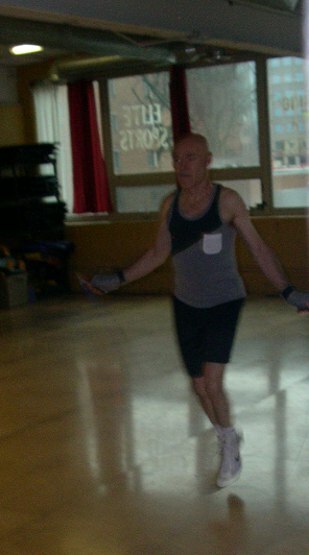 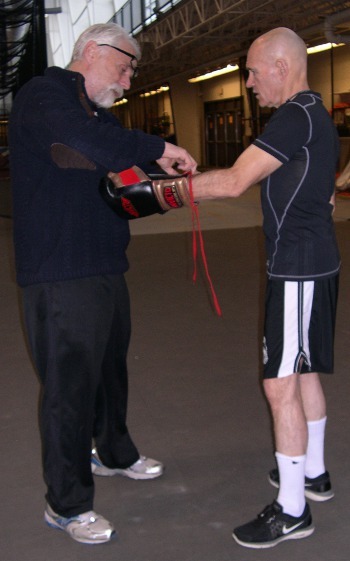 Then we switched from 2-minute rounds (doing 6 rounds per session) to 3-minute rounds (4 rounds per session). 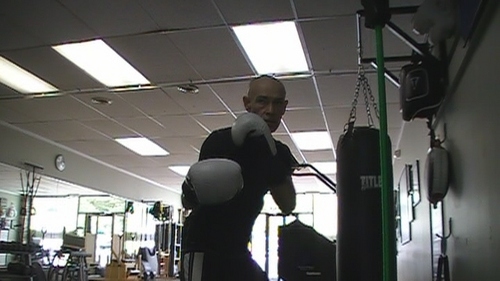 We did 5 3-minute rounds for a couple of sessions, and then moved up to 6 3-min. 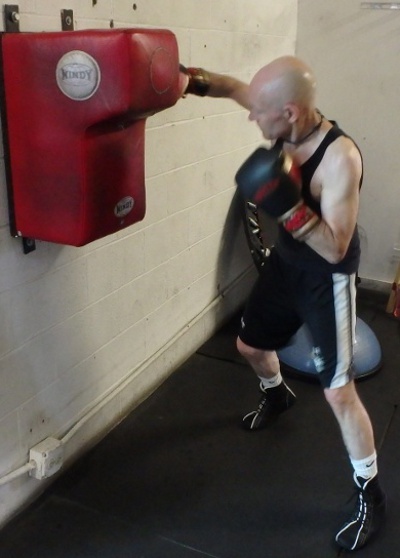 rounds, twice a week. 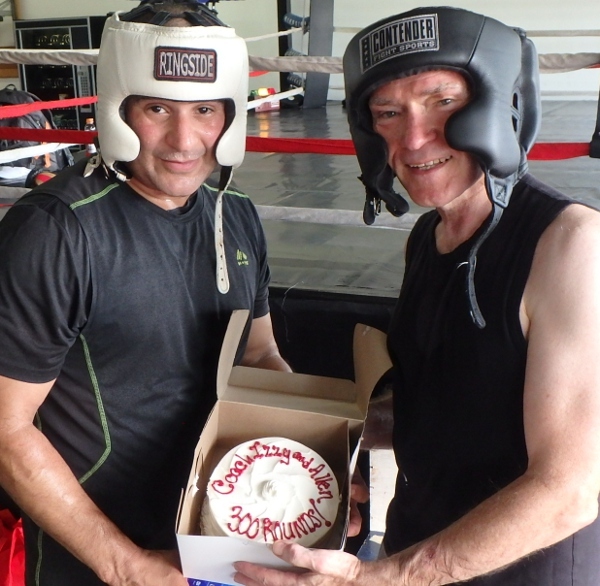 In July 2016 we hit 300 rounds, having worked together about 8 months. 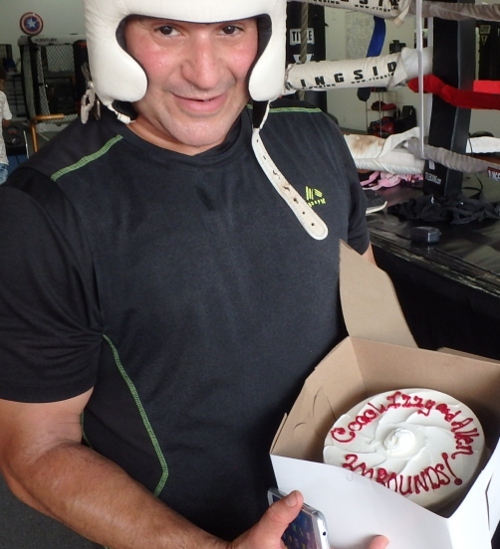 Called for a cake. 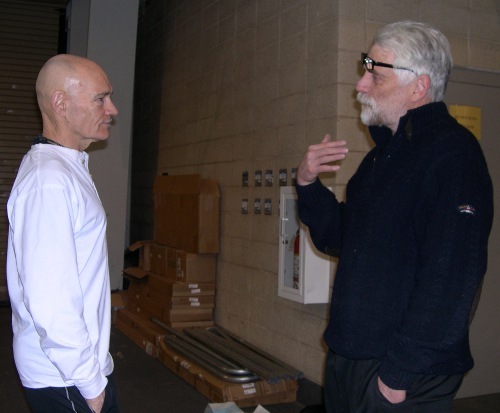 Thanks, coach, for making it real. 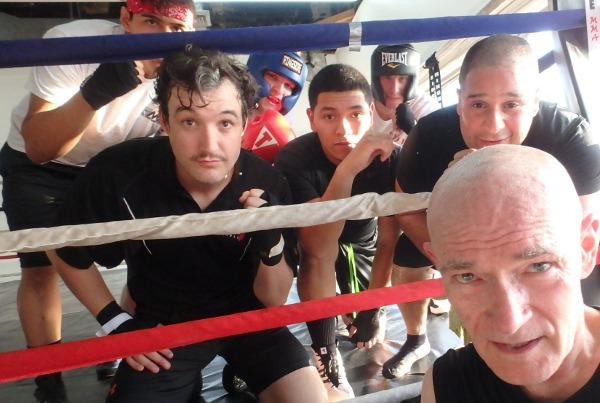 Shots after sparring at Extreme Kung Fu @ 5951 N. Clark, Chicago. 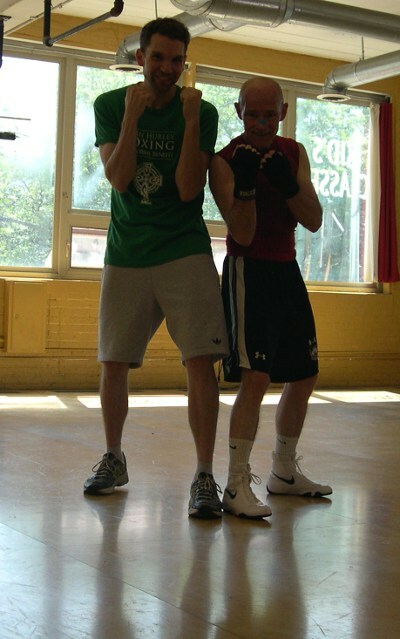 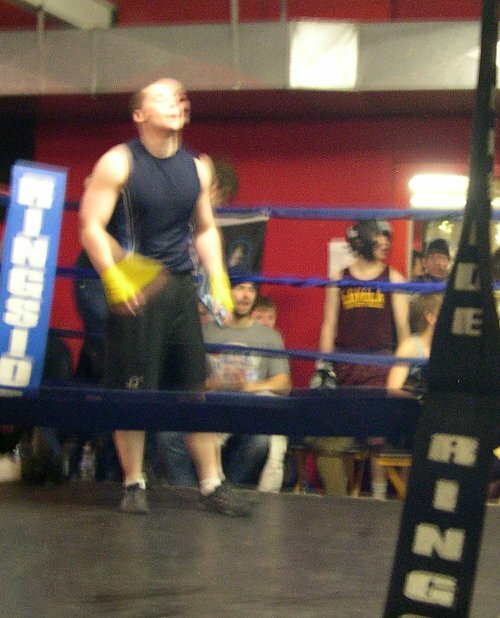 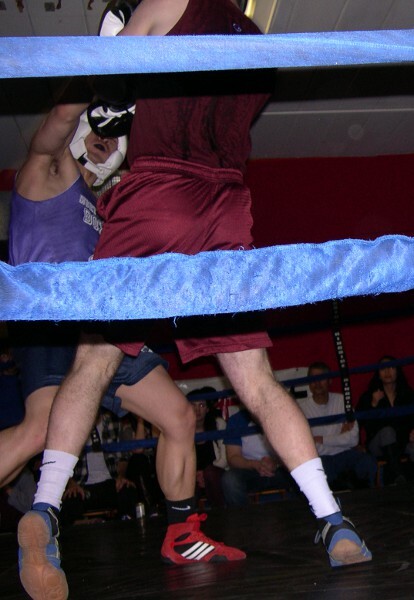 Besides having a lot to learn about boxing, I have a lot to learn about posing for boxing pictures! 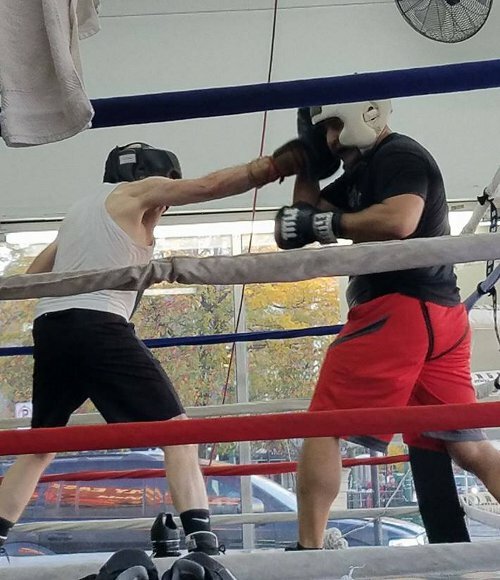 10/18/2016 a lucky day for me, actually landed one! 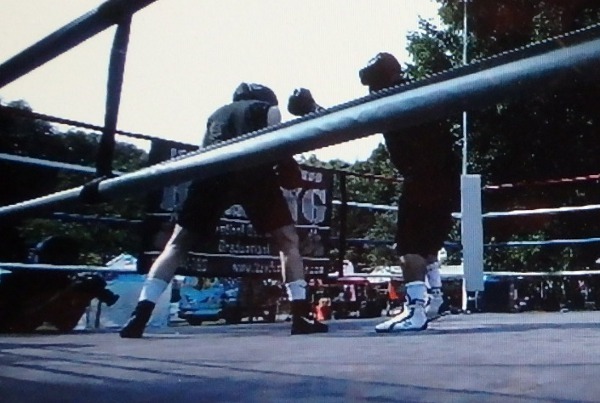 Big fun & bragging rights, small cost. 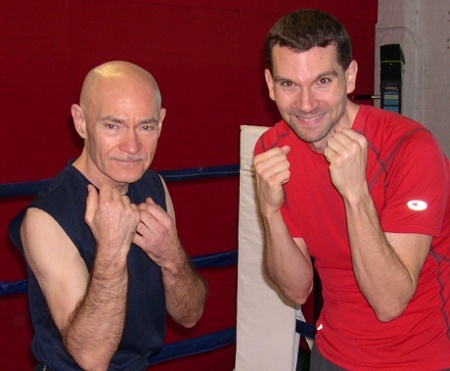 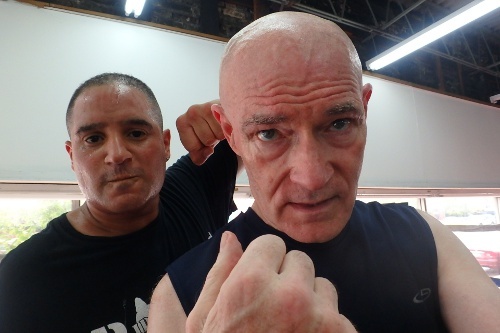 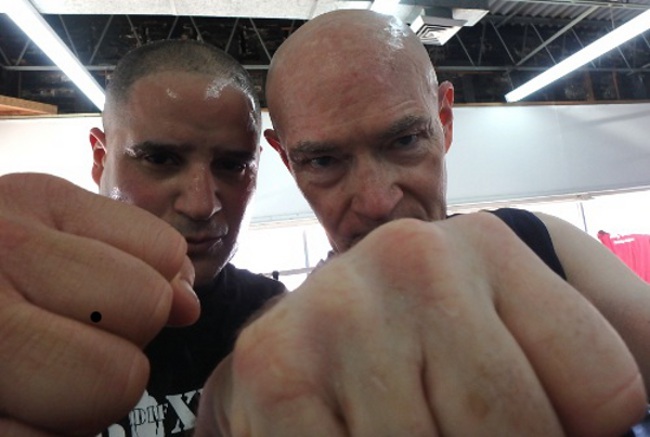 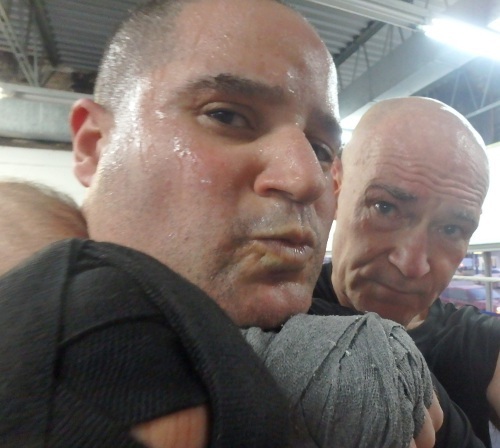 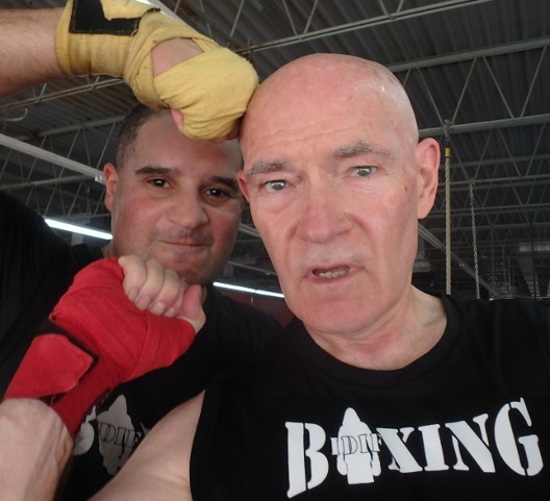 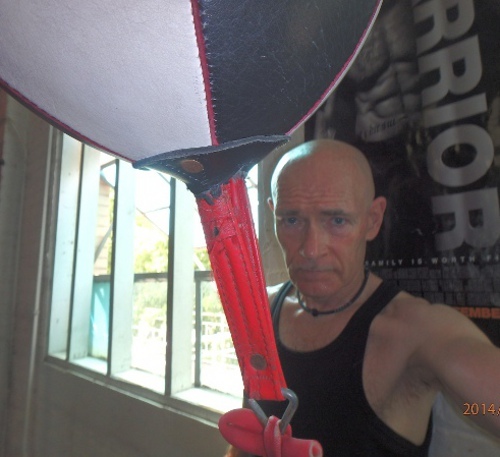 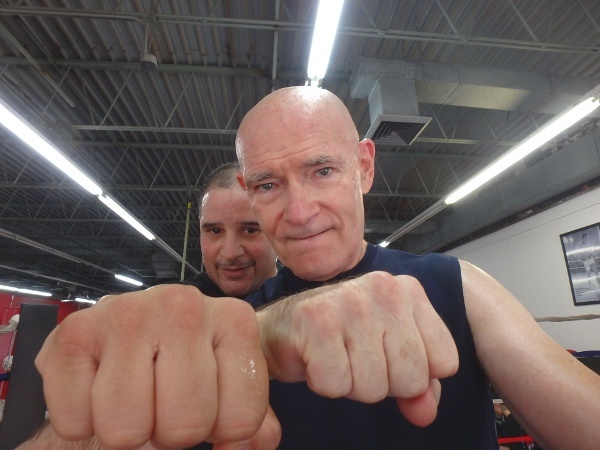 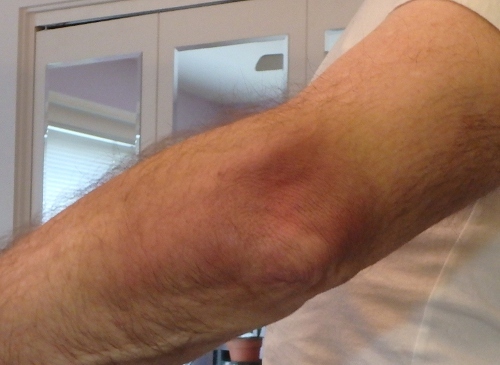 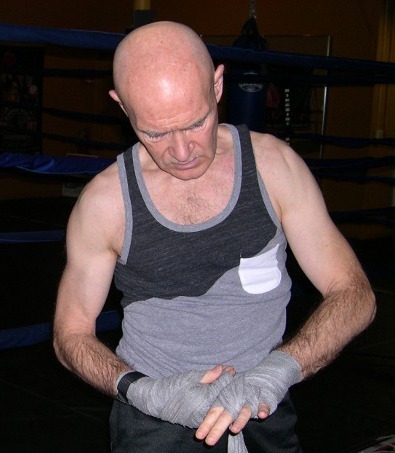 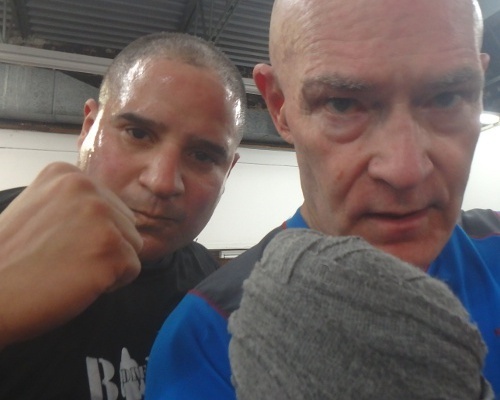 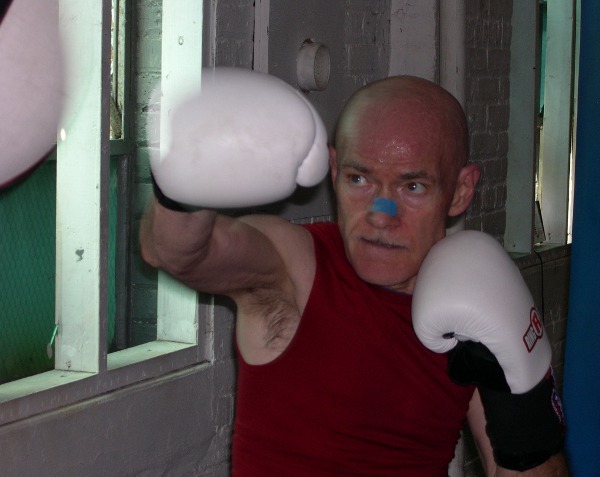 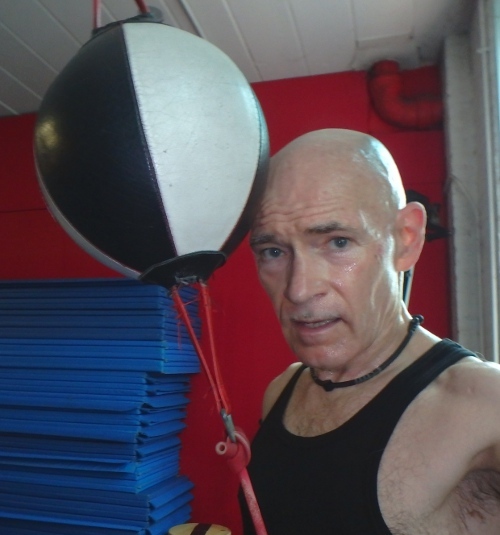 Coach says I hit myself with my own gloves, but . . . .
Boxing at Extreme Kung Fu @ 5951 N. Clark, Chicago. 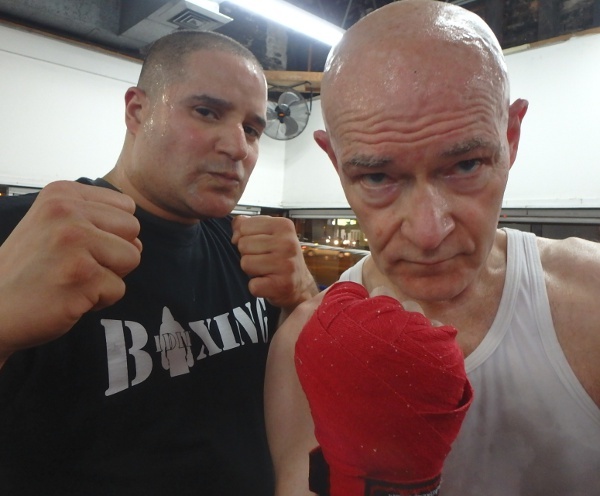 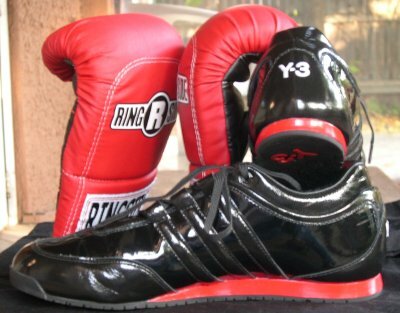 I started with Thursday night and Saturday morning boxing classes. 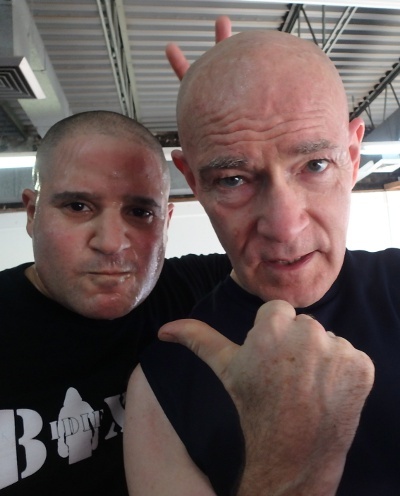 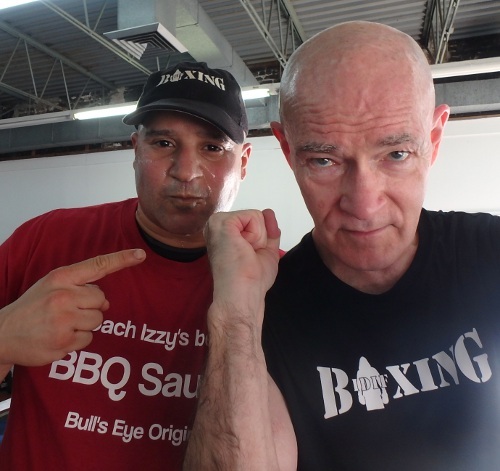 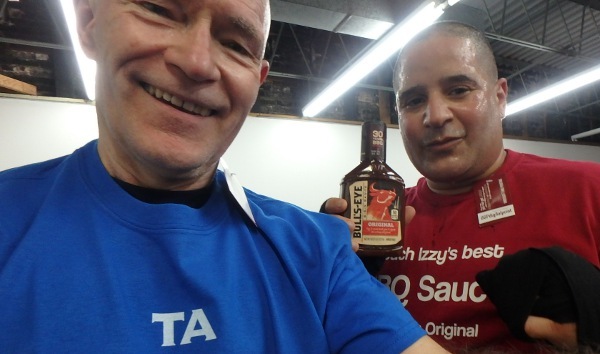 The fitness class on Thursday was tough but gave me a chance to get to know Coach Izzy, and soon I switched to working in the ring with him as my coach. 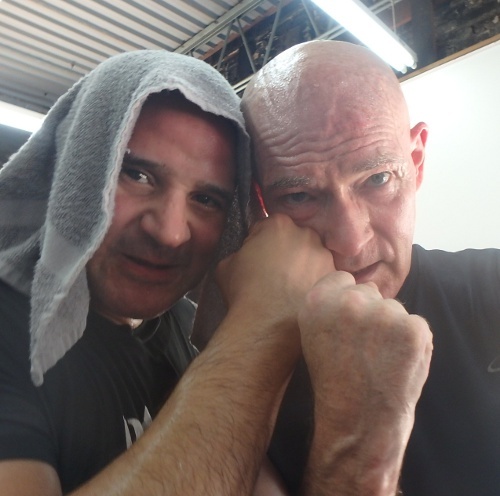 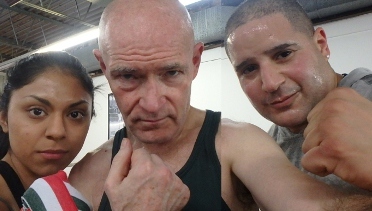 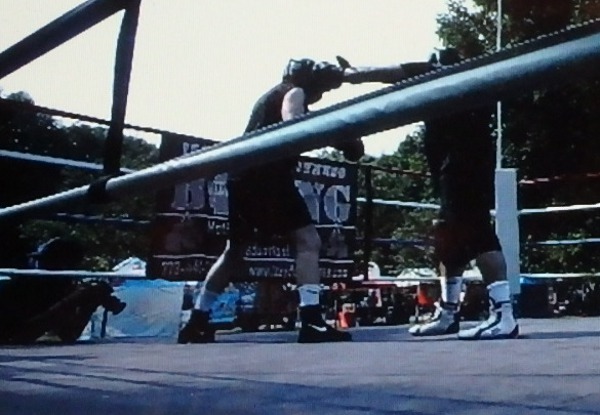 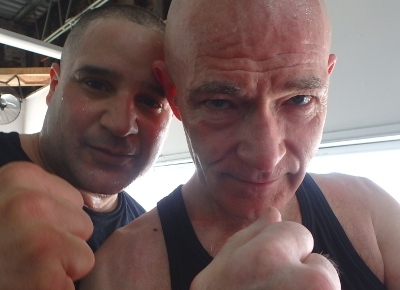 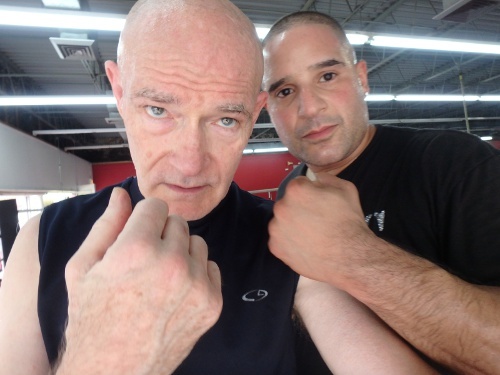 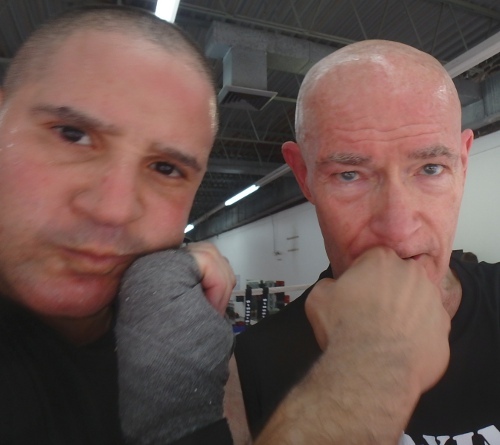 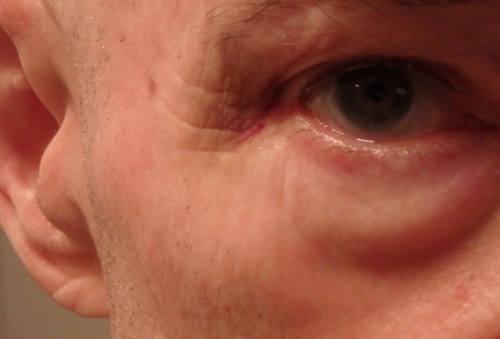 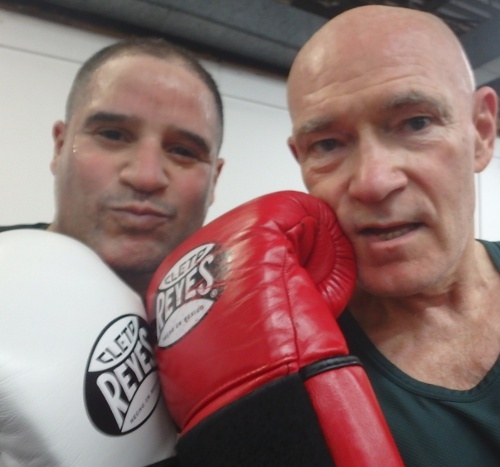 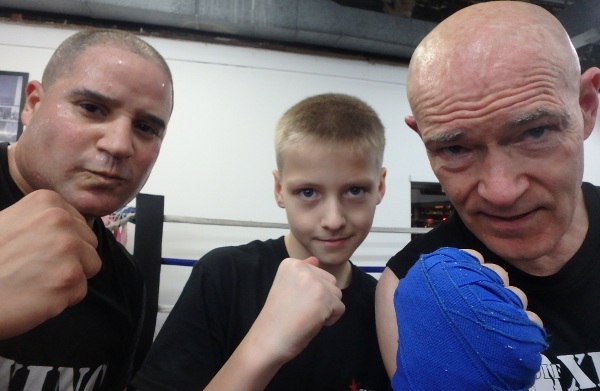 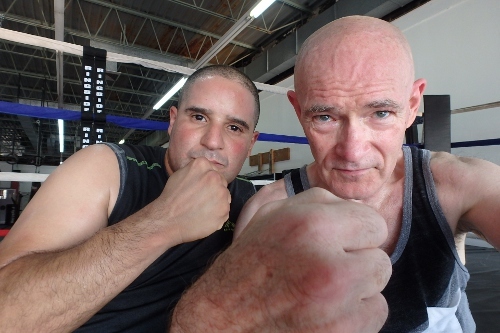 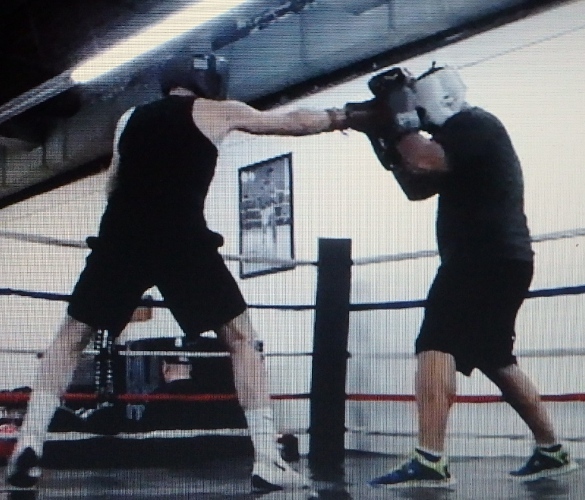 We started sparring Oct. 22, 2015, 3 2-minute rounds. 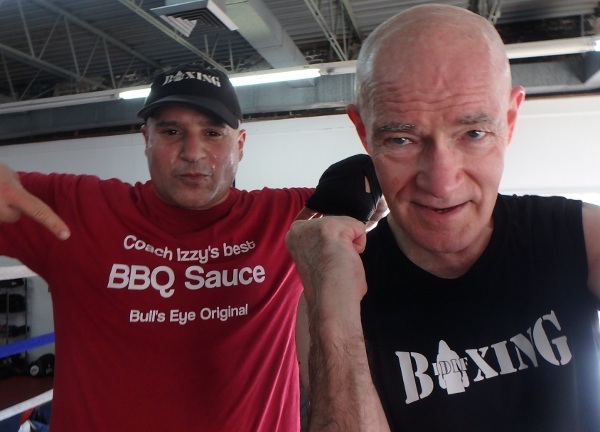 By the end of 2015, Coach Izzy Gonzales and I had gone 93 2-minute rounds. 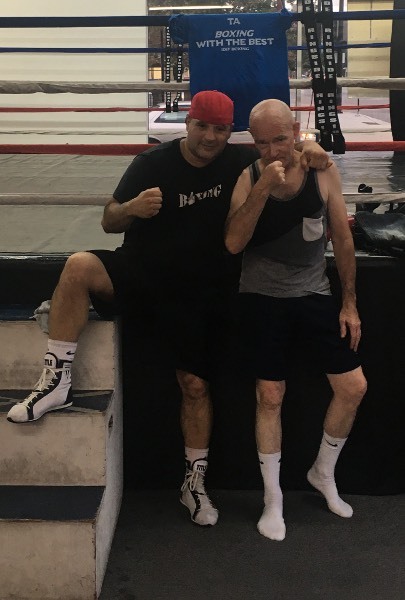 That's a lot of sparring! 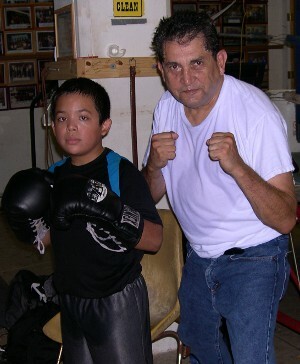 Thanks to a great coach! 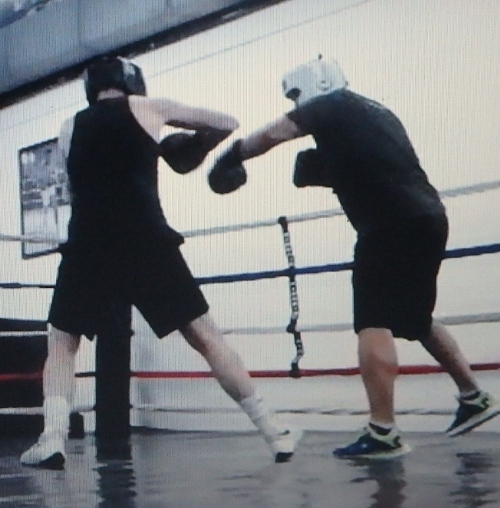 When we started out, coach had a "dry" look at the end of our sessions (upper & lower left), but not any more. 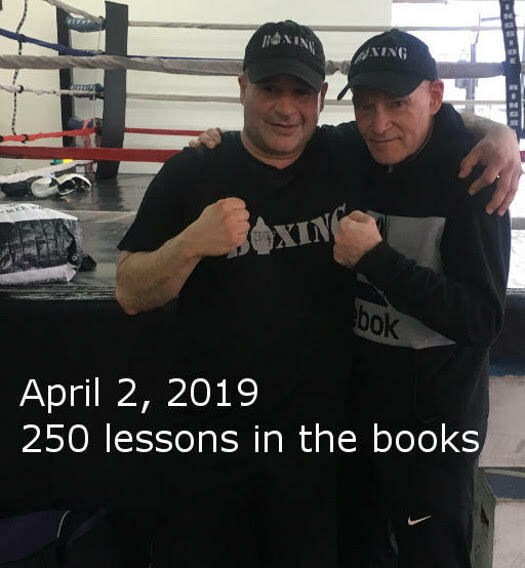 One door closes at the EBC, another opens. 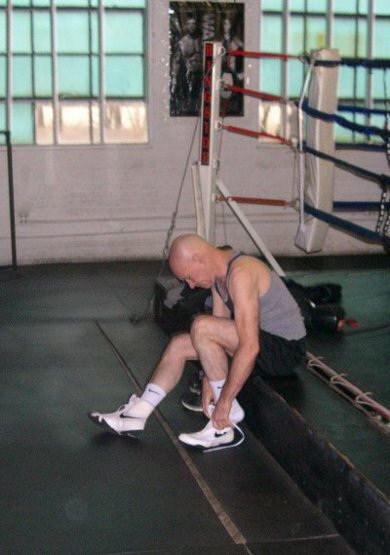 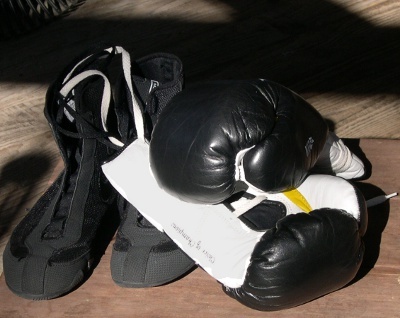 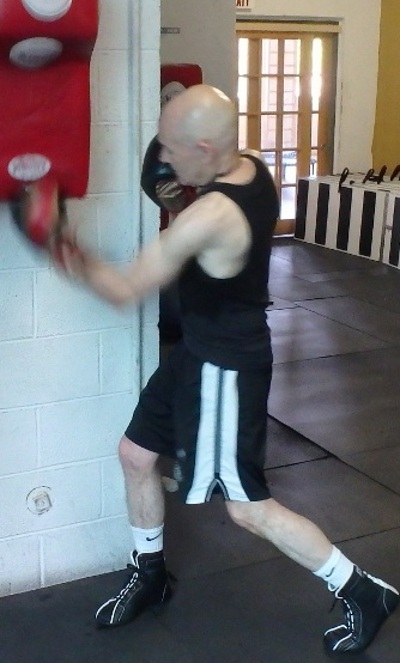 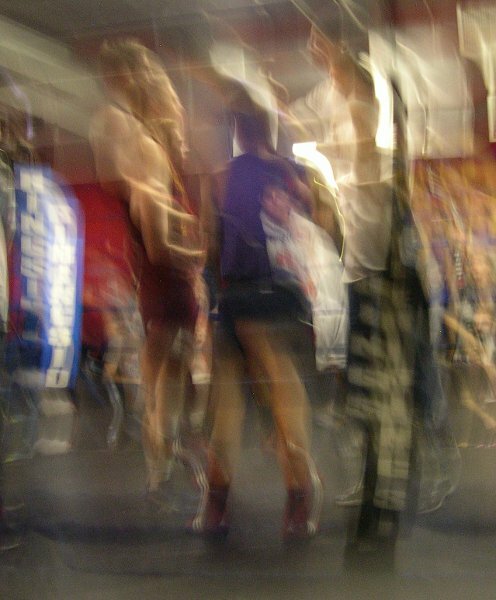 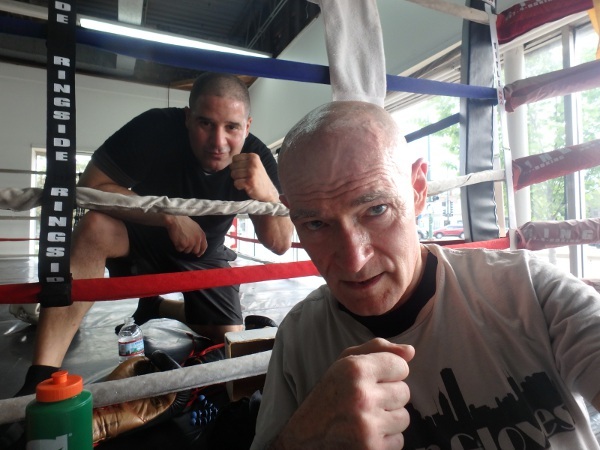 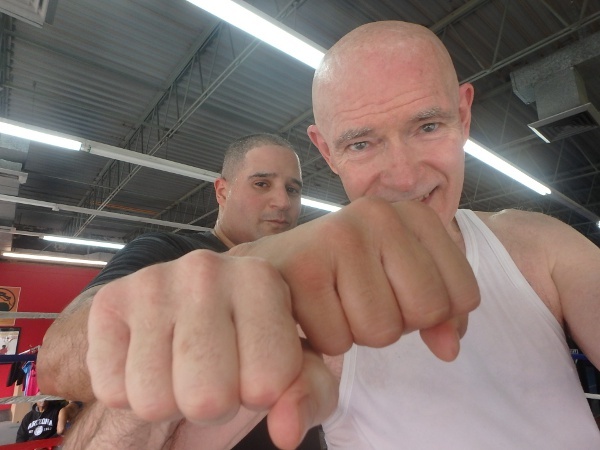 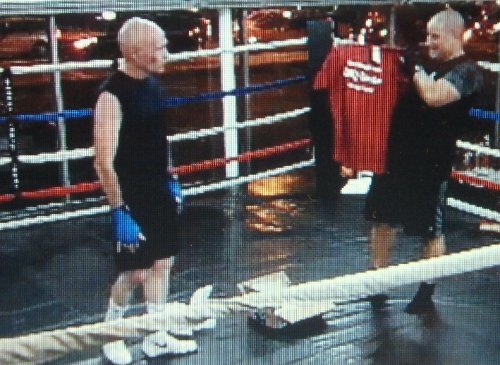 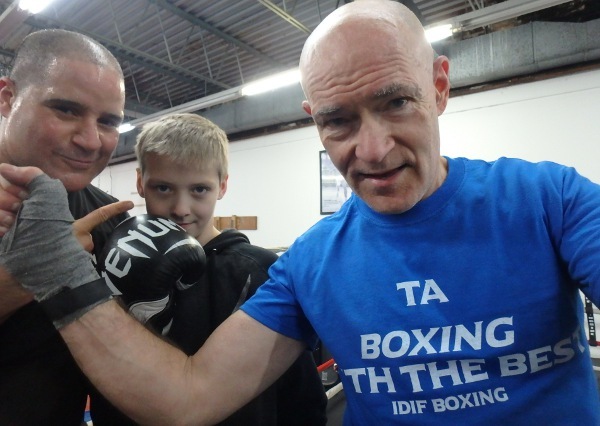 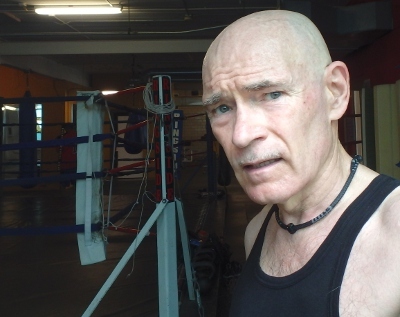 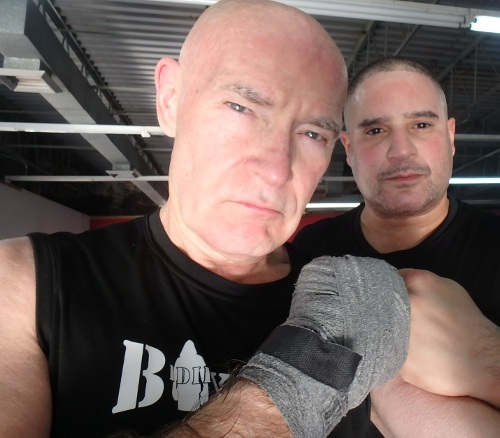 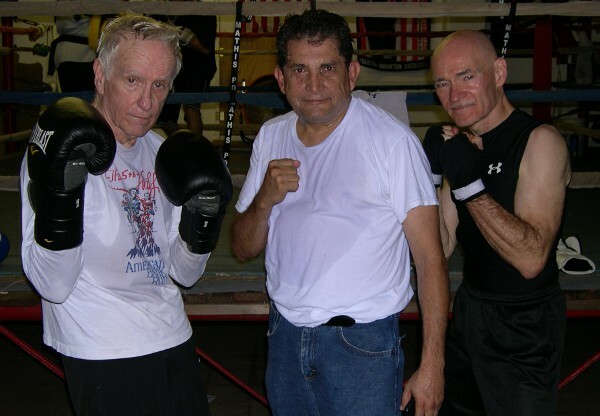 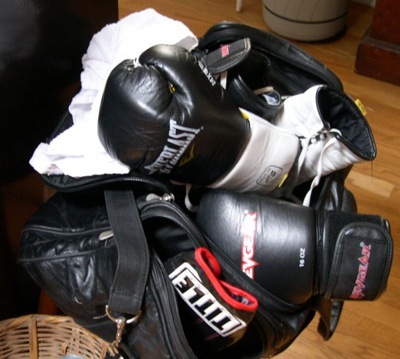 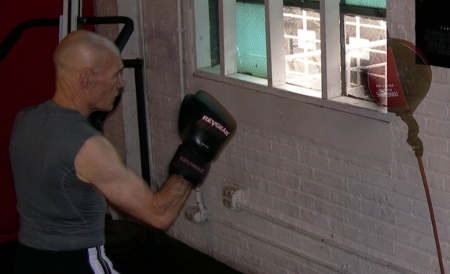 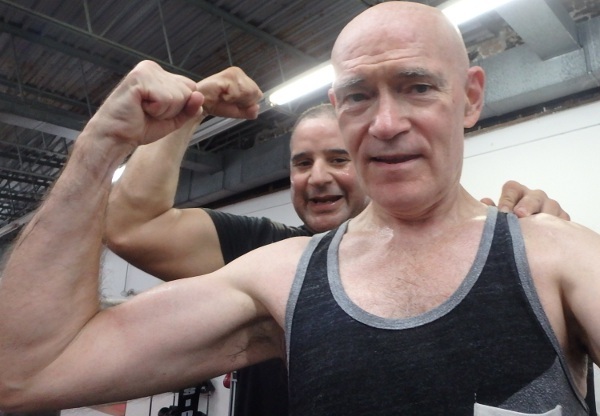 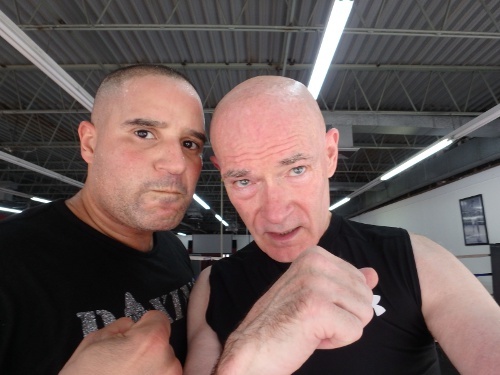 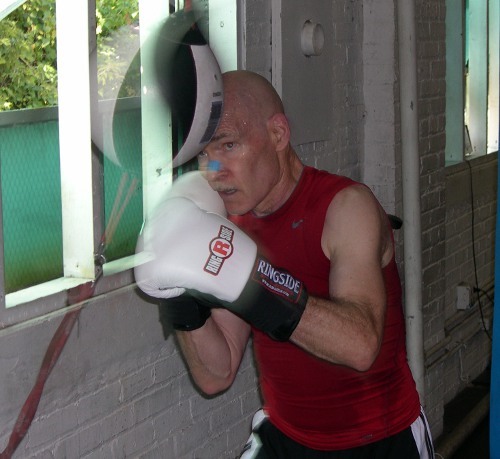 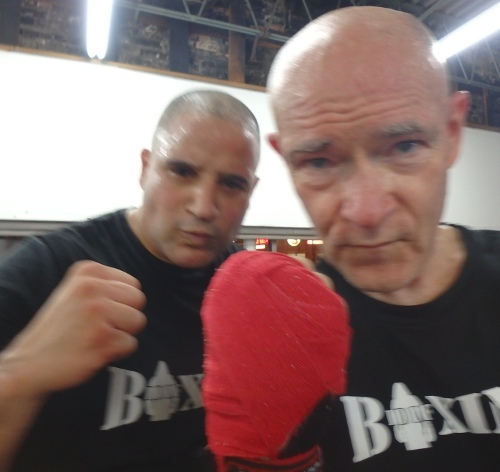 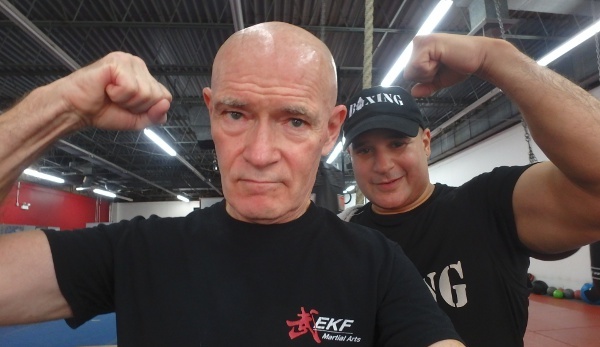 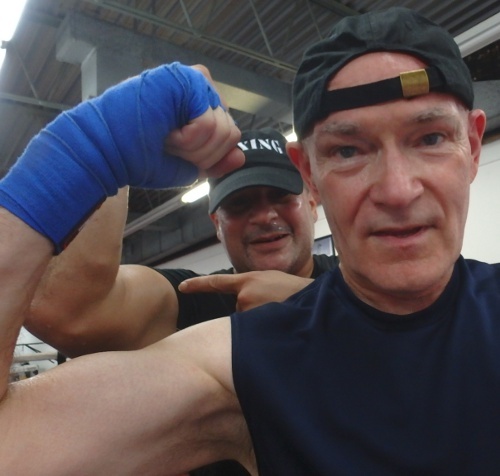 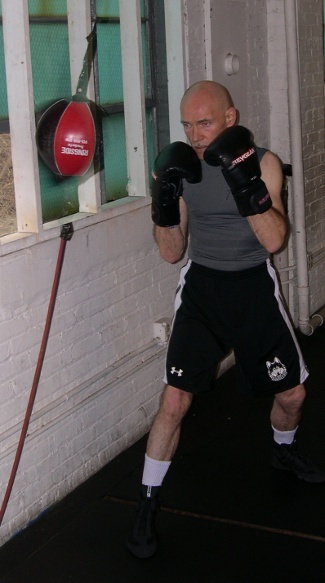 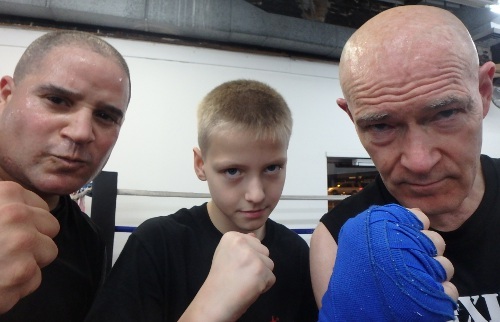 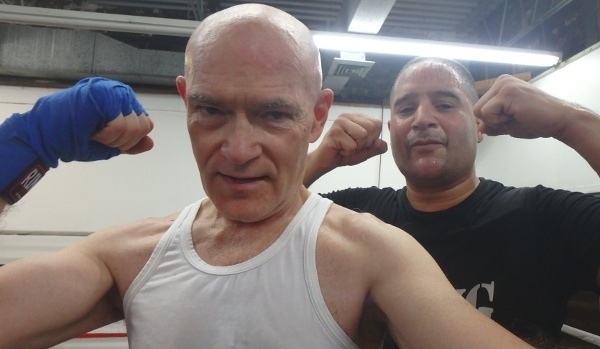 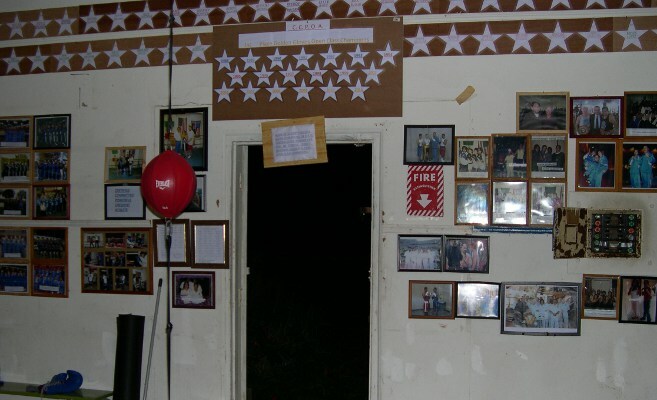 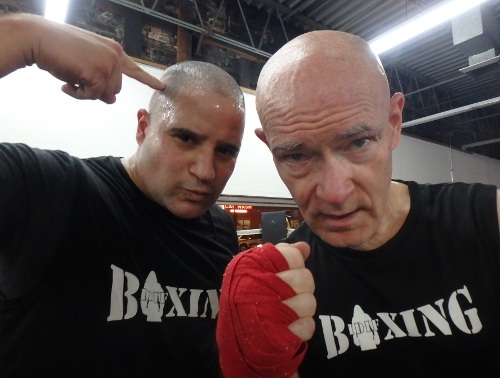 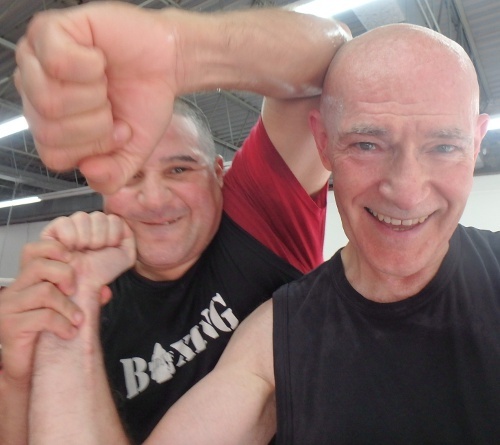 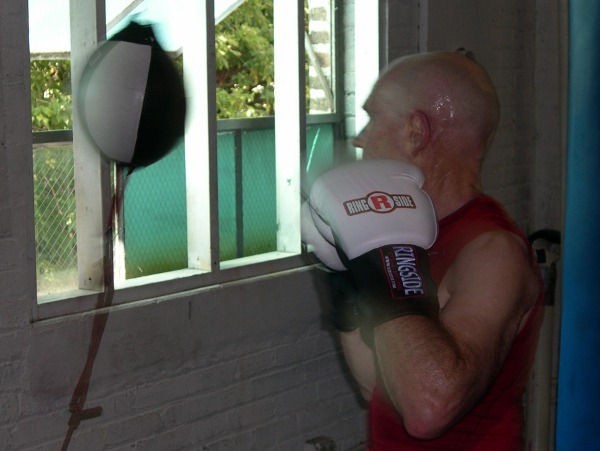 The Evanston Boxing Club closed at the end of July 2015. 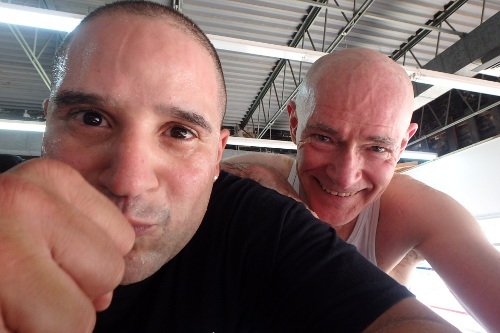 Here are some of the last pictures I took there after my last workout with Andrian. 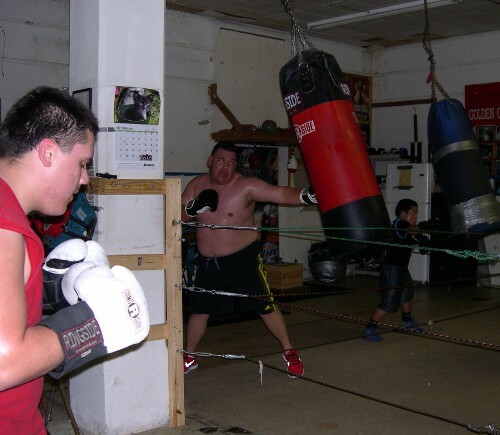 And here are some workout and coach pictures around the EBC that I took in my first years there, 2011-13. 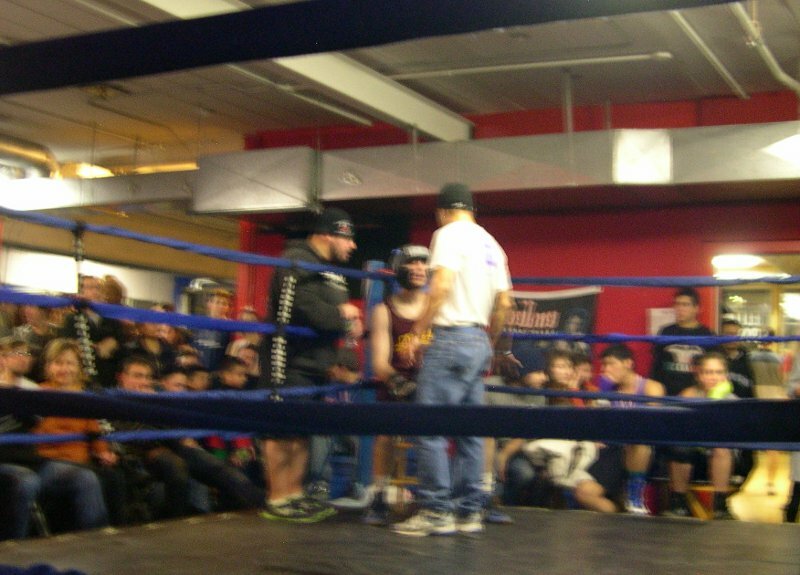 February 22, 2014, was one of many Fight Nights at the EBC. 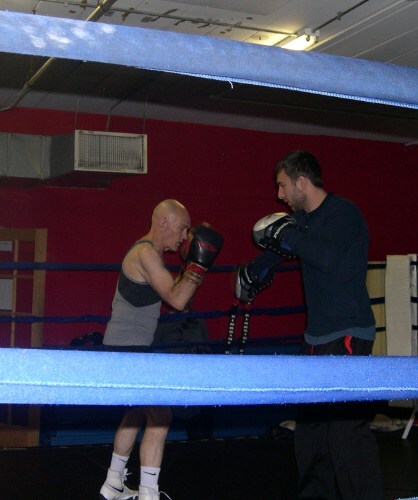 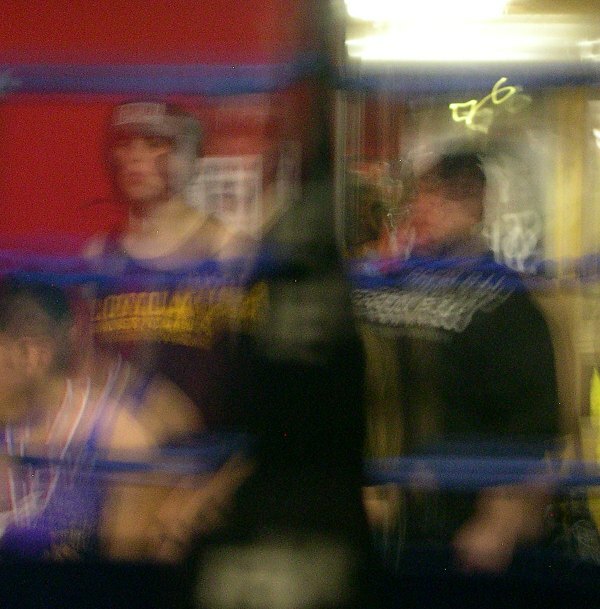 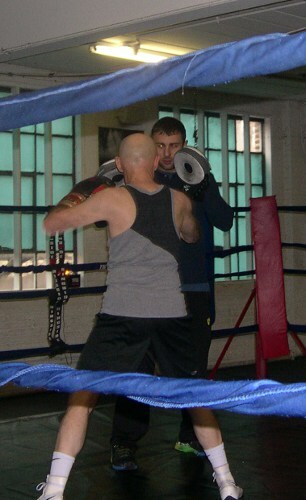 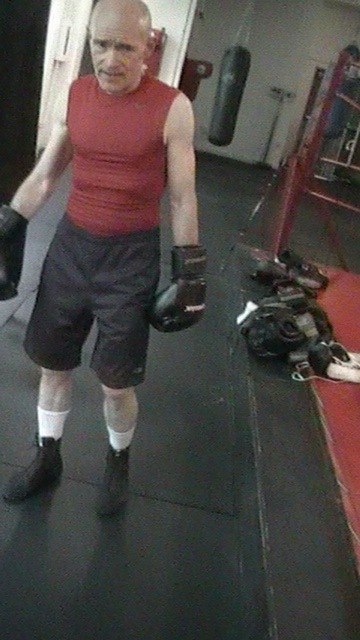 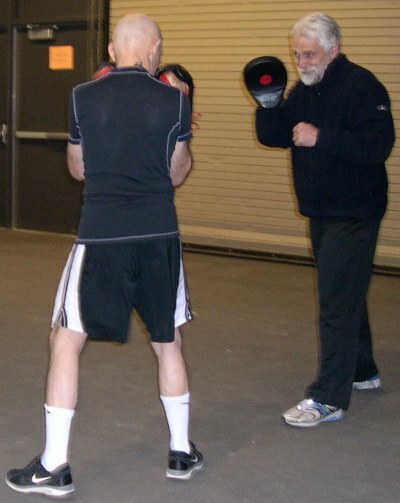 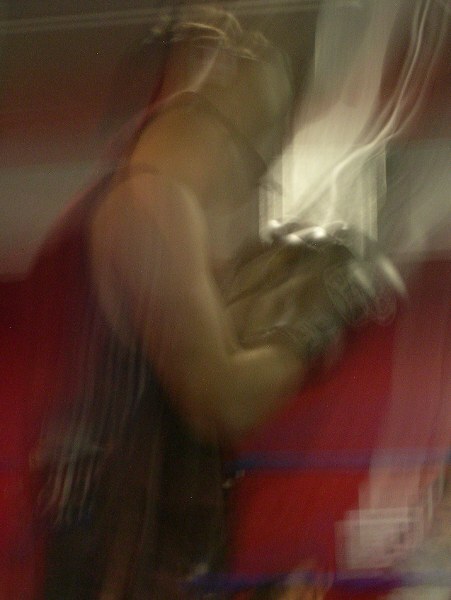 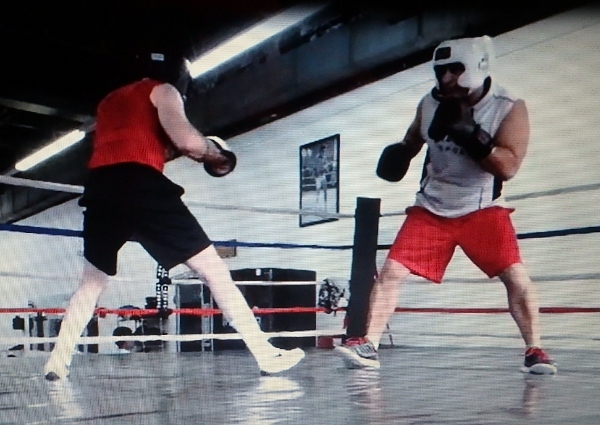 Loyola Boxing Club founder Ryan Motzel sparring, below. 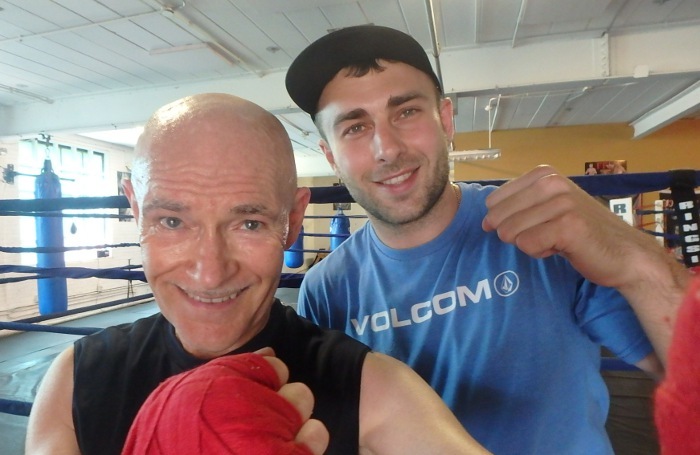 Pictures from my work with Coach Mark Carlson in August 2013. 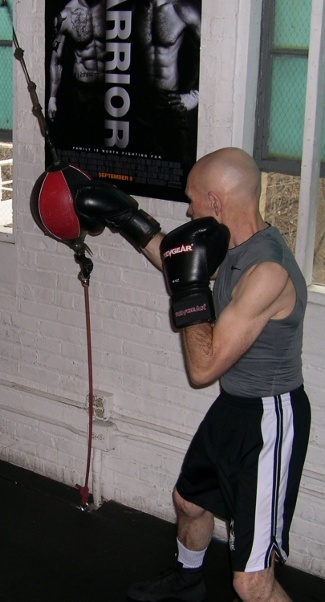 Photos by Mark Carlson. 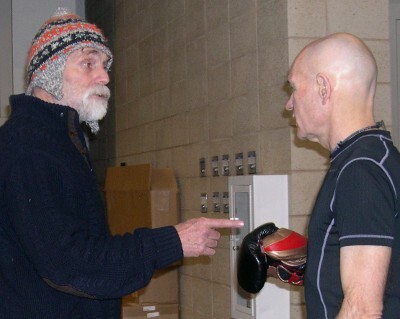 In December 2013 I stopped in Northfield, MN, for a short workout with Gordon Marino at St. Norbert's College. 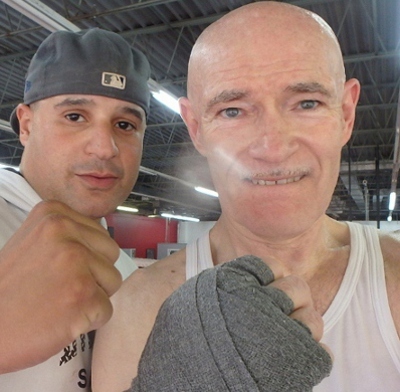 Marino is a boxing correspondent for the Wall Street Journal. 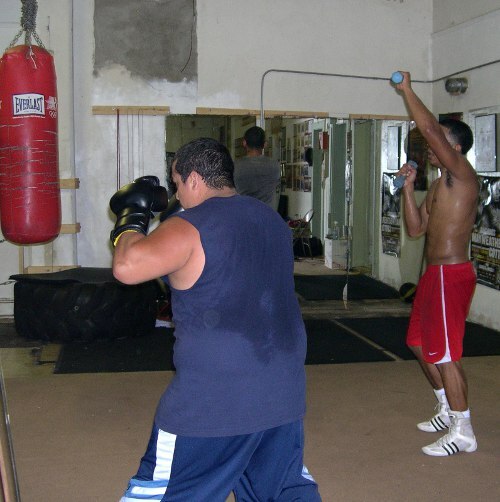 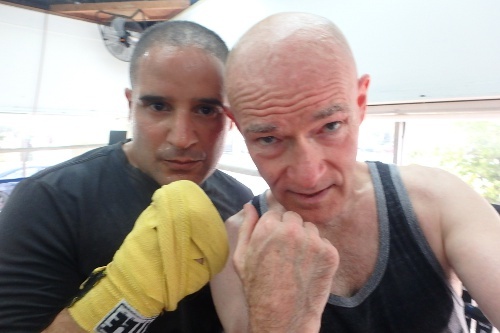 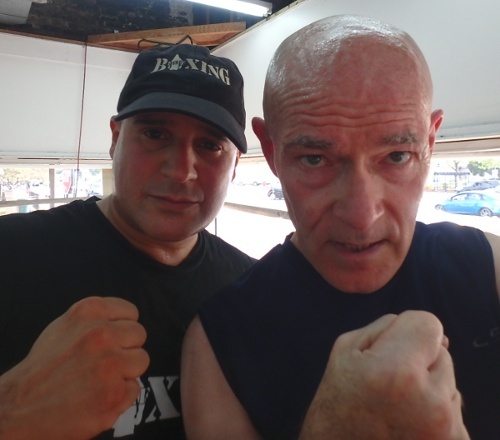 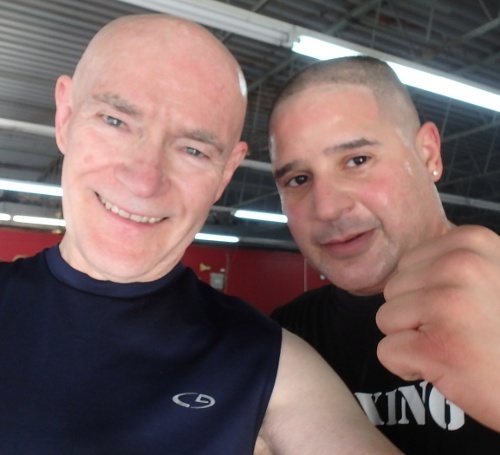 to meet boxing coach Rafael Davilla and boxers at this gym there. 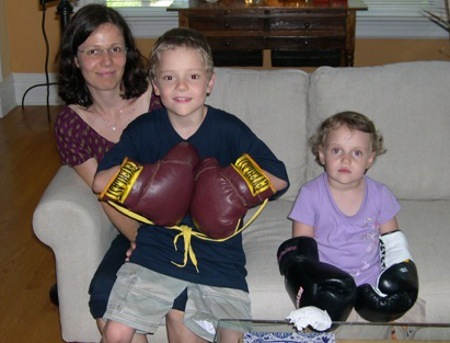 In August 2011 I helped some young visitors from Prague into gloves. 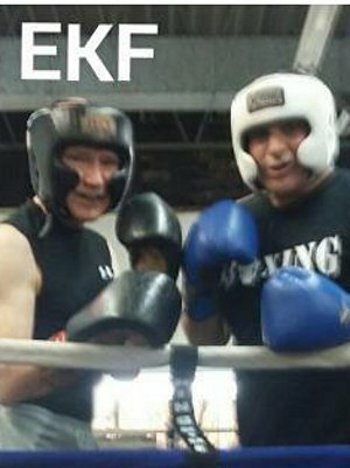 There were some great pro boxers at the EBC. 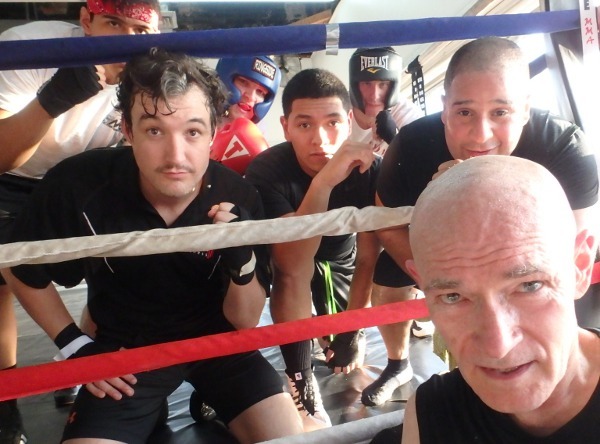 They included Russell (Rocky) Fiore and Paul Littleton. 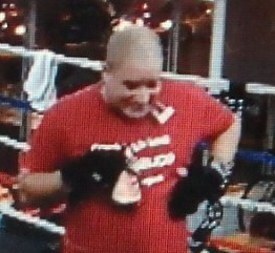 That link shows Paul in an amazing video. 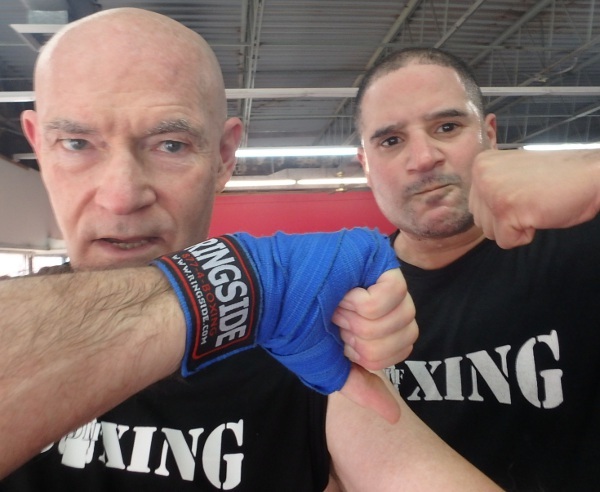 You can find them both on Facebook and at BoxRec--Paul and Russell (requires login, but it's free).